In a meeting of the European Economic and Social Committee (EESC), he pointed the finger at Sweden, Denmark, The Netherlands, Austria, Germany and Finland; the ‘rich’ member states refusing to increase their contributions. Normal human beings think, logically, that when a member of the family leaves home, he will not pay board anymore, and also that one person less means lower housekeeping costs. The European Commission and the European Parliament have a different way of thinking: they just want more, much more, budget after Brexit. No Brussels insider is surprised; these two institutions always want more: more money, more buildings, more staff. It makes the Commissioner responsible for Budget, the German Gunther Oettinger (the commissioner who missed getting the Vice-President title, due to his disparaging remarks about women, Jews and southern-Europeans) very angry. Some of them argued that ‘a smaller EU should mean a smaller budget’, not even a maintenance of the current budget! Members of the EESC asked for the ‘own resources’ of the Commission to be increased. Oettinger had another go at the member states. ‘Commission proposals are blocked by member states’, he said. His examples: a 3% levy on digital revenues of large firms (Google, Facebook) and the Financial Transactions Tax. But member states don’t like to leave taxation to the Commission and the Parliament, bearing in mind the saying ‘You don’t let the dog fill his own food bowl’. The battle on the EU’s Multiannual Financial Framework 2021-2027 has started. 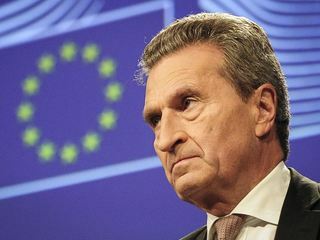 Oettinger would like to finish the negotiations before the European Parliament Elections in May 2019, to send a signal to EU citizens with his higher budget. Wouldn’t a lower EU budget surely send a better signal?